Stove Top Method: Method 1 - Wash fresh okra. Remove stems and cut okra into 1/2 inch rounds. 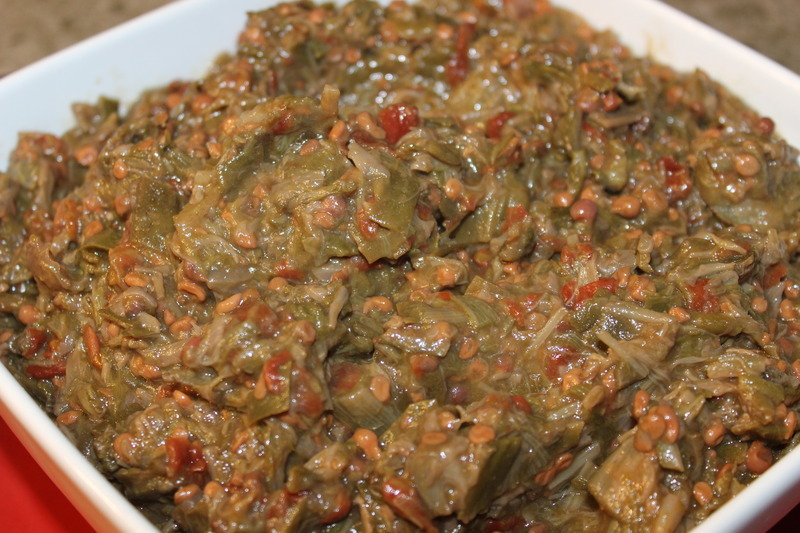 In a heavy saucepan or Magnalite cookware, cook the okra, onions, tomatoes in the oil over medium low heat stirring continually for about 45 minutes to 2 hours (depending on the amount you are cooking) until the okra is no longer slimy and has achieved a light greenish brown color. Don't forget to stir, stir, stir to prevent sticking and burning. Do not use cast iron as the acid in the okra will remove the seasonings in your cast iron pot. Also never warm up any okra dish in a cast iron pot. Stove Top Method: Method 2 - Some cooks will sauté the onions and bell pepper in one tablespoon of oil until wilted in a separate skillet all the while cooking the okra in a separate pot until the okra is a light greenish brown color . Then will combine the okra, tomatoes, salt and Tabasco; cook for 10 minutes longer or until the tomatoes have cooked down, Again do not forget to stir, stir, stir to prevent sticking and burning. Check your seasonings and serve as a vegetable side dish, with rice and gravy or make the okra and shrimp gumbo. Cei cest bon! Oven Method: Method 3 - Preheat oven to 350 degrees. If you're using frozen okra, defrost in a microwave or at room temperature. Using frozen okra from your local supermarket allows you to "pick" okra anytime saving time and freezer space. They are generally packed in one pound or three pound bags. In a large Magnalite pot or Dutch oven with a lid, add the oil. Add the cut okra, onion, bell pepper and tomatoes. On the stove top, heat until the pot is warm (although warming the pot is not necessary before placing in the oven, it does help speed the cooking process). Cover the pot and place in the preheated 350 degree oven. Set your timer for 1 hour. Take out and stir thoroughly. After the first hour, repeat this step at 1/2 hour intervals. After two hours you can judge if you need to cook longer. What I like to do is cook this dish in the late evening say sevn o'clock; I cook it for two hours and then turn off my oven and leave it in the oven until the next morning. The heat left in the oven will continue to smother ("cook it down") the okra. No need to stir. In the morning, the okra will look just like you remember Momma's smothered no slime okra. Ready to be frozen or used in your shrimp and egg okra gumbo.